Simon Says Stamp and Show: Challenge: What are you known for? Challenge: What are you known for? What are you known for? Do you always have a cup of coffee in your hands? Are you forever adding brown ink to the edges of everything? Is no project complete without a button? Whether you feel like being inspired by something you’re known for in your crafting, or if you’d prefer to scrapbook or journal something that you are known for in general we can’t wait to learn a bit more about you and your crafting. Absolutely anything goes as far as your challenge inspiration and project type with this one of course - we just want to see your wonderful style and signature crafting! We hope you'll join in the challenge. Before we get any farther I'm happy to announce that we have a new member joining our team - and we couldn't be more excited! Please help us welcome the amazingly talented Anita Houston to the team! Anita frequently participates and creates beautiful things for our challenges on a regular basis so we are all very excited to have her join us. 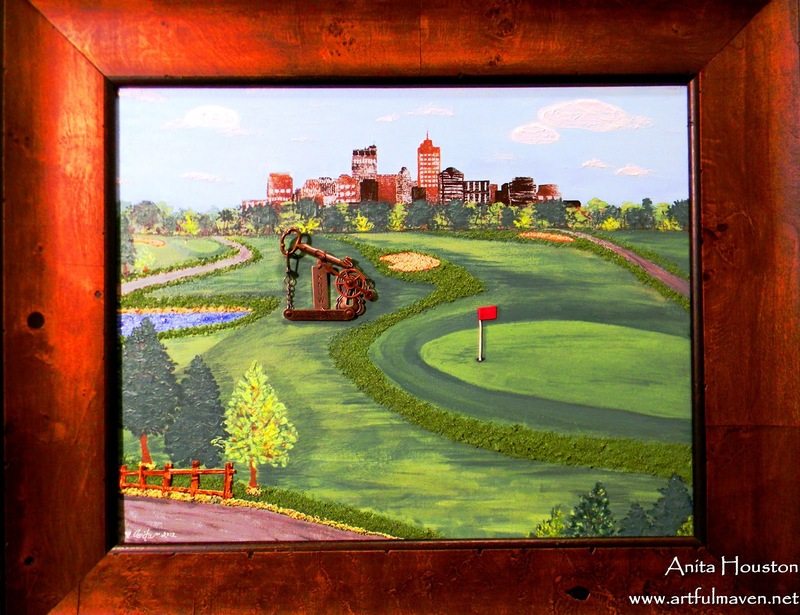 For her first project with us, Anita has made a 16x20 inch mixed media painted canvas based on some photos she took of her husband's local hangouts to gift to him. First of all, what an honor it is to be here! WOW! Thank you so much Simon. I am still pinching myself! However, I was very taken aback by my very first challenge design. It was the hardest one I've ever had, and it caused me to do a lot of self reflection as a crafter. I have no idea what I am known for creatively speaking, because I like to do pretty much everything that is creative, or at least try it. So after careful thought, I hope to be known for being able to create a scene, as it seems that I make a lot of projects depicting a scene of some sort. Personally speaking though, you can say that I am known for being very happy, because it's a thrill to be on this DT with all of these fabulous people! To make this golf course scene I used several colors of Claudine Hellmuth's Acrylic Paint as well as Ranger's Acrylic Paint Dabbers. A Hero Arts Newspaper Skyline Stamp was used with Archival Inks onto tissue paper to create the downtown buildings. 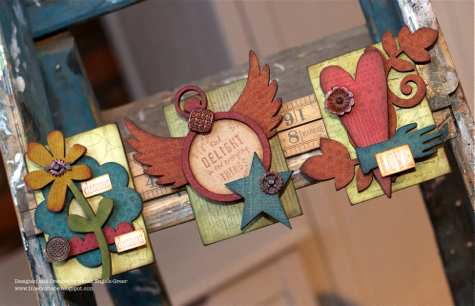 Several different foliage stamps from Tim Holtz and Wendy Vecchi were used with the paint. Wendy's Embossing Paste made the clouds and some of the hedges and rough areas, along with a little Flower Soft. Finally, lots of Idea-ology metal pieces were used to make the oil pump. Ashli asked her friends and family what they would say she was known for and the answer was unanimous! It's true, I do love to be comfortable. All of my friends and family know it and when I asked them what they would say I was known for, they all answered, "wearing pajamas!" In fact, I often forget that I have them on and will head out for the mail or a little time in the garden in my polka dot get-up. I'm sure it's quite amusing to all of the neighbors! I even had this silly picture I snapped of myself while on a recent camping trip and this was the perfect opportunity to scrap this little quirk of mine. After grabbing some Basic Grey Soleil paper and some Studio Calico bits and pieces, I added some texture with a bit of white paint and my go-to Studio Calico stencil. 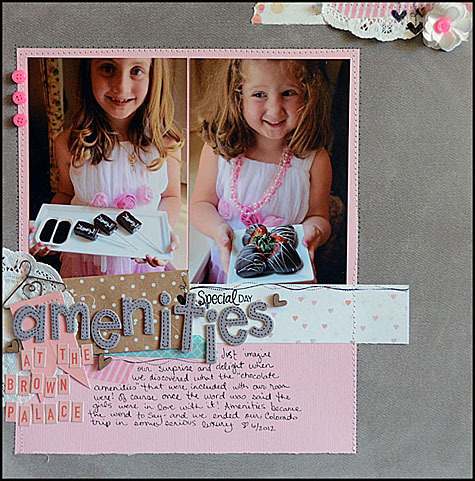 Some simple layering and a few Crate Paper Chipboard pieces complete this fun page! Tracy created a collaged piece which she added to a frame showcasing some of the things she is known for. All my close friends and family know I love hearts, I collect anything heart related, jewellery, home decor pieces, garden ornaments you name it, I have it. I am also a lover of rustic and natural pieces and my framed home decor piece showcases that perfectly. Hearts - check, cut using the Alterations Love Struck Die; texture (I love texture) - check, added using Wendy Vecchi's White Embossing Paste; I love the embellished look - check including buttons from Prima Flowers Nature Garden Wood Buttons to name but a few of my embellishments used in this piece. I had to remove the frame to take some photographs due to the glare from the glass. Why do I always make pieces that are so difficult to photograph? I am also known for not thinking things through, I just create what is in my head without any thought about how I will photograph said piece! Suzz had to think about this challenge a bit, but ended up combining quite a few things she loves in one card. When I was thinking about what I am known for I thought about images, colors and my creative process. My favorite images include anything with wings. The Stampers Anonymous Classic #1Stamps has a beautiful Dragonfly which became the focal point of my card. My other great passion is colors and how they complement, highlight and reflect off one another. This was the other main component of my card by using the Metallic Distress Stains to create soft monochromatic effect with a hint of silvery/blue. The Mistakes and Creativity Sentiment captures what I feel like when I am creating. I think the creative process is a journey for me, I am always taking different paths and never know where my artistic journey is going to end. You can always count on Candy to create something detailed, dimensional and different. It's hard to determine what you're known for when you try to hard to not be pigeon-holed into a particular style or genre. I love all things vintage. I love Tim Holtz style. I love dimension and I love detail. But, I try to keep my ideas fresh and different. So, I incorporated the things I love into something that I am NOT known for; making a card. Top that, an easel card with a drawer! Now THIS was a challenge! Pink Paislee's London Market Papers were the basis for this card. I added Coffee Archival Inked stamps from Tim Holtz' Stuff To Say and Attic Treasures. 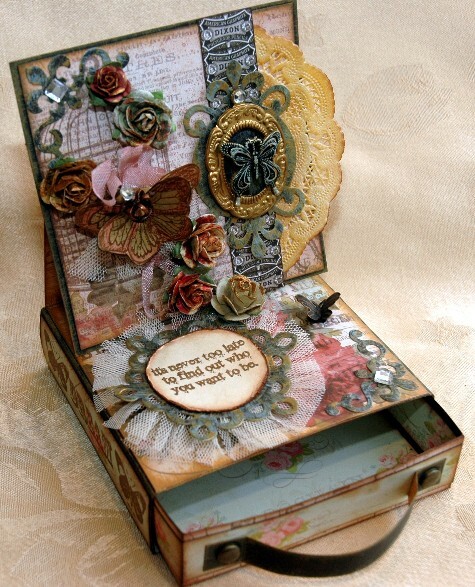 Add a sweet little butterfly from Tim Holtz' Mini Blueprints 2 colorized with Tattered Rose and Bundled Sage and let it flutter through the beautiful trailing Prima Avon Roses. I have to admit, it was much easier than I thought it would be to create this shabby chic inspired card. Don't you love it when that happens? Trace almost always has some homemade inked papers on her project. I believe in my crafting projects, while at least lately I am known for making my own background papers. Being a little OCD/perfection striving, my biggest struggle is covering up the already pretty backgrounds. My crafty friends see me struggle with this all the time. So I have bought an art journal in hopes that it will free me up to be more spontaneous and just let go- I hope to show you in the future a more messy and free me. For this background I used some of my favorite spray inks: Heidi Swapp Color Shine in colours Primrose and Sweet Cherry, and Dylusions Ink Sprays in colours Bubblegum Pink and Postbox Red. 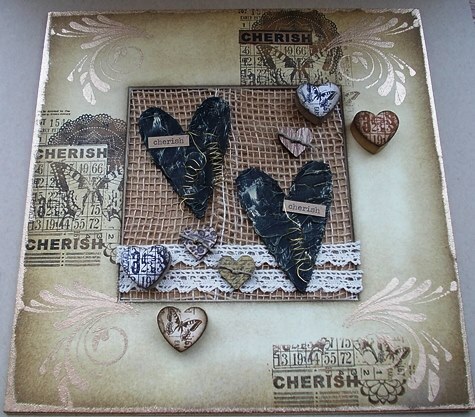 I have added a few other favorite elements that you see in many of my projects: My Favorite Things Rolled Roses die using Tim Holtz Idea-ology Grunge Paper, and a Word Band also from Tim Holtz Idea-ology line. If you'd ask what Sandra Mouwen is known for, the answer would be her use of embellishments. I do like my Wooden Stars and my Jute Twine dearly. If I get the chance I use it on everything. In my personal life I'm known as the lemonade girl. Because I drink lemonade all day... Back to the card, it's the invitation to my birthday party. I made the background from scratch, and I did that by using my favorite Script stamp. I made some splatters with the Dylusion Sprays Vibrant Turquoise and Black Marble and for some sparkle Glimmer Mist Aquamarine. I so like the font of the Memory Box Lower Alphabet dies. Before I die cut the letters it painted the Black Bazzil cardstock with some Pearl Paint Dabber. It gives the cardstock such a pretty silver color. Anna-Karin made a layout which is her in several different ways. I made this layout after a fun, but very busy, day with two friends. Although it was great, I needed some quiet time afterwards, and since I love being outdoors, I decided to scrap this photo from a trip to the sea. The layout includes some of my favourite things: ink turned into watercolour, resist stamping and mist, die cuts, more stamping, white embossed vellum, a clear element, a wood veneer person, and some great quotes.The background was misted with Dylusions ink and I used the Word Play die for the large letters. 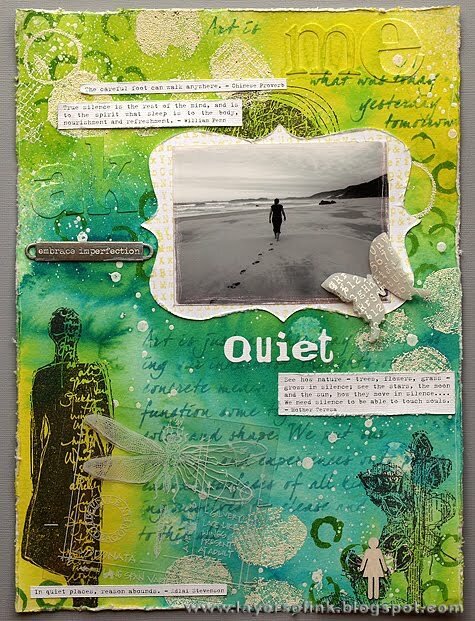 I had to think for a while about this challenge theme as I like all kinds of styles, colours and crafting but a look back through my blog and a rummage in my stash soon showed me the light! I figured my love of the three D's could best be illustrated with a trio of Wendy Vecchi mini Art Parts lovelies and stamps. I love using a combination of reds, greens, blues and browns and Distress Stains are just fabulous for quick coverage. I love designing and always spend hours working on composition, jiggling all the pieces around until I think it works. These three pieces all finished with Blossom Bucket Buttons are set onto an old folding ruler for an original and very handy wall mount. Dan likes to try and get as much value from his stamps as he can. Although I have a lot of stamps, I still think carefully about each purchase, evaluating how much use I think I'll get out of a particular stamp or set. What I like best of all are images that have potential to be used and re-used in many different ways. I think one of the things I'm probably known for is my habit of "disguising" my stamps in order to get more use out of them. Take the phrenology head stamp in the set of 3 cards shown above, it offers so many creative possibilities for extending it's "life" by making a few small changes to the way it's utilised. I also made use of Cavallini & Company Numbers tape and the Darkroom Door Woodgrain background stamp. I (May) am certainly not known for following rules when it comes to my crafting so using the new Simon card kit for a scrapbook layout seemed perfect for this week's challenge. I'm a happy crafting kind of girl, so I cut loose and just let myself play with no expectations this week. Funny, many of my most 'known for' bits in my scrapbooking managed to show up! Gotta love that. Speaking of love - I love scrapbooking with the Simon card kits because it gives me bits and pieces of papers and embellishments (not to mention stamps!) and lets me use up my own plentiful stash (something else I'm known for!) of alphabet stickers! I adore pink, doilies, hearts, chocolate, and of course my daughters - so I'm delighted that so many favorites of mine and things I love were able to be worked into this one layout. click on our design team's blog links so you can learn more about what they love in their crafting and see more photos (and full supply lists) for their projects. 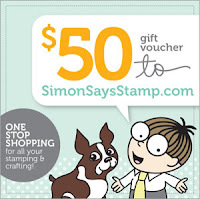 As always, Simon Says Stamp is giving away a $50 gift voucher that will go to a random entry chosen by Random Generator. To qualify all you need to do is create a new project that ties in (in any way!) with our theme and post it, along with a link back to this challenge, and add a link here. This challenge will end at 11:59pm on Sunday January 27th EST. congratulations to Anita for becoming part of this fab team her art is fab! some great dt work on a hard challenge! It´s great what you all are known for and waht you did with this challenge! What a fab idea for a challenge! Wonderful inspiration from the Team too! Huge congrats to Anita, she will be an assest to the already inspiring DT. Great theme for this week. WOW! What an array of beautiful work by the DT members. Huge congratulations to Anita, she so deserves this opportunity. The DT have excelled themselves again this week - a really wonderful challenge and thank you for so much inspiration. Happy to see Anita has joined your team. Love her golf course piece! Amazing creations - such an array of talents and tastes! Smiles. 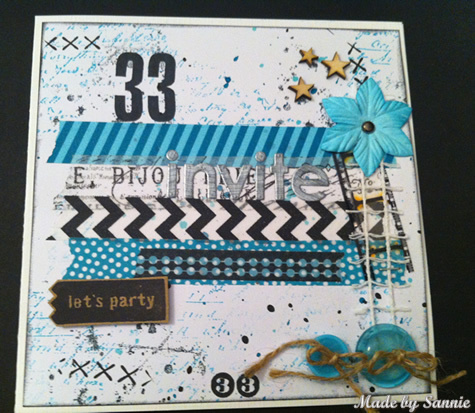 Lately all I want to do is make Pop N Cut Cards so I entered my Card in this challenge! Thanks SSS! Congrats to Anita! Woohoo! Love her work. DT again came up with a "challenging" challenge! Love all the projects, especially as it gives a little peek into their personalities! That set of ATC's using the same stamp made me laugh...!! (especially the clown version). Awesome work from the DT. I do see your signature styles in your samples! Anita I'm HAppy to to find you here!! All works is truly inspirational! WOW WOW WOW!! Absolutely beautiful projects!! Very talented DT! I've been following Anita's work for a while, and you couldn't have gotten a better team member. Blessings! Fantastic Challenge..really made me think..............difficult when I get home from work !! Gorgeous makes by the DT. Great ideas, DT!! Keep them rolling! Thanks for the chance to share my art with you all! Wonderful DT inspiration as always! Thank you for the comments SSS&S lovers...I appreciate it so much!!! Many, many congratulations to Anita, such a lovely lady and she will be an asset to the DT. Wonderful work, as ever from the DT and great inspiration. Always great design team samples...love your challenge site. Thank you for the challenge! Love the imaginative challenges you come up with and the DT as always do a great job with futher inspiration. Congrats to Anita for getting a part in this team.